44-page Bible atlas; 8 clear plastic overlays; full color; 5.5 x 8.5 in. Fits inside most Bibles. Then & Now Bible Maps Insert by Rose Publishing was published by Rose Publishing in November 2008 and is our 2955th best seller. 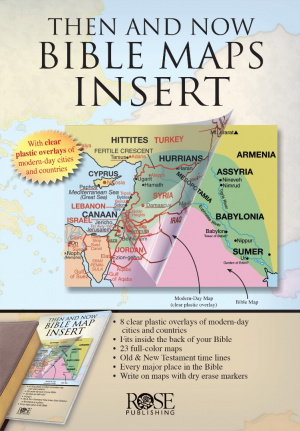 The ISBN for Then & Now Bible Maps Insert is 9781596362932. What The Bible Says About Money. Be the first to review Then & Now Bible Maps Insert! Got a question? No problem! Just click here to ask us about Then & Now Bible Maps Insert.